Oh, what an intense read. 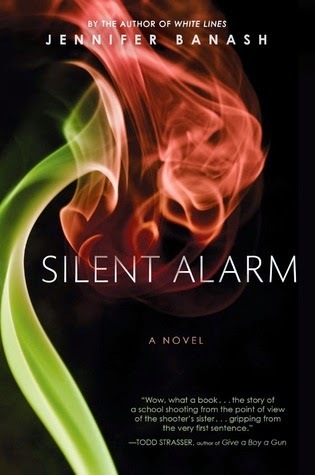 I started Silent Alarm, thinking I would just see what the writing was like before passing the book on to one of our guest reviewers, and found it nearly impossible to put this book down. I was caught up in the story from the first page, and Banash didn't let up until the last words of the book. Silent Alarm is about Alys, whose brother Luke kills fifteen students, and then himself, one day at school. Alys and her parents are left to deal with the aftermath. I confess that with all of the school shootings in our nation, I never once stopped to think about the shooter's family members, and what their lives would be like after the shootings. Those left behind did nothing wrong, and certainly aren't to blame for the actions of their family member, yet the people who have been wronged, and the community at large need someone to blame. And that blame falls on Alys and her family. They find themselves ostracized, ignored, and worse, a constant object of intrest in the press. The reason why Luke shot and killed those people, and then himself, is the crux of the story. No one ever expected this of him, and Alys, who feels like she knew her brother better than anyone, has no idea what prompted him to murder and suicide. What made Silent Alarm so gripping for me was the fact that Alys sees Luke and Miranda, the girl she hid underneath a table with in the library as Luke was killing students. Luke eventually shoots Miranda and Alys feels guilty that she didn't try to stop him. After their deaths, both teens start appearing to Alys. At first, it felt ghost-like to me, and I didn't like it (I don't do ghosts at all). But, the more I read, I realized that Luke and Miranda were more like Alys' subconscious come to life. She has to make peace with them in her mind before she experiences any real relief from the grief of her brother's death. Alys is tormented by the fact that she grieves her brother, despite what he did. It would be such an unsettling feeling to grieve a murderer, your brother, whom you loved dearly. And it's all the worse as the reasons why Luke did it start to surface. Silent Alarm is a relevant and thought-provoking read. Banash is intense in her prose and I find myself thinking of this story weeks later. I know that some won't like the openness of the ending; however, I found it to be a perfect fit for the story. I really liked this book and will definitely read Jenifer Banash again.